Major depression and bipolar spectrum disorders affect a significant portion of the world population at any moment (around 4%) and account for a high socioeconomic burden, as well as for a major loss of quality-adjusted years of life. None of the current treatments for depression are more than moderately effective on their own, and further, they commonly need weeks before eliciting a definitive response. The first antidepressant prescribed usually leaves 30-50% of patients unaffected, with less than 30% achieving full remission. Furthermore, a significant percentage of patients with depression and bipolar spectrum disorders (around 20%) do not satisfactorily respond to any chemical treatment, psychotherapy or electroconvulsive therapy. Neurotransmitters are chemicals that affect the communication between neurons in the brain. A neurotransmitter called serotonin is currently thought to contribute to feelings of well-being. It has been found that the amount of available serotonin in the brains of patients with major depression is lower than in normal patients. Therefore, the first form of treatment for major depression is usually composed of drugs such as Prozac or Zoloft, which contain chemicals that are hypothesized to increase the amount of neurotransmitters, such as serotonin, in the brain. These drugs are usually referred to as “selective serotonin re-uptake inhibitor” (SSRI). However, they are not as selective as their name implies, since they affect multiple neurotransmission pathways. Furthermore, many medications take up to five weeks for full effects to manifest, and there is an increased occurrence of suicidal ideation and suicide in this period. The amount of available serotonin in the brains of patients with major depression has been shown to be lower than in normal patients. Therefore, the first form of treatment for major depression is often a selective serotonin re-uptake inhibitor (SSRI), such as Prozac or Zoloft, which contains compounds that are hypothesised to increase the amount of neurotransmitters, such as serotonin, in the brain. However, these medications are not as selective as the name implies, since they are compounds that affect multiple neurotransmission pathways. Furthermore, many medications take up to five weeks for full effects to manifest, and there is an increased occurrence of suicidal ideation and suicide in this period. Patients are cautioned against this on the label with a “black box warning”. Interestingly, the amount of circulating serotonin in the brain is already increased within a comparatively short time after the initiation of treatment — so why do antidepressants take such a long time to develop their effects? The long induction period contradicts the serotonin hypothesis. The full extent of targets responsible for depression and the exact mechanism of antidepressant action are not know with certainty. The initial boost of neurotransmitters produces a long-term adaptation in the central nervous system (CNS) eventually leading to the antidepressant action. If proteins produced in higher amounts by this adaptation response (upregulated proteins), more effective treatments could be developed. However, this finding has not been incorporated in any drug approved against depression yet. In fact, drugs representing a completely new rational drug design approach have not been approved for decades, meaning that almost all the antidepressants in current use are targeted at increasing the concentration of certain neurotransmitters in the brain and therefore only elicit an indirect effect that is poorly understood. A new class of antidepressants that yields a rapid remission (hours) in treatment-resistant depression has serendipitously been recently discovered. It was observed that by administering ketamine, an anesthetic commonly used in surgery, symptoms of depression were rapidly relieved, even in patients with treatment-resistant depression. After the discovery of the antidepressant effects of ketamine, preclinical trials were then conducted with the compound. Reports by psychiatrists about the off-label use (use of an approved medication for something that is not the primarily intended purpose) of ketamine as an antidepressant and informal reports of abusers of the drug using it, also as an antidepressant, surfaced. The observed effects lasted for up to two weeks after a single administration, suggesting that proteins, created in the brain, rather than direct action on any receptor, were behind the improvement, since the half-life of ketamine is less than 3 h. Impressive results were obtained; a substantial response being observed in 50-80% of patients compared to an initial response rate of 30% with any one of the currently accepted antidepressants. Even more importantly, suicidal ideation, which is a major cause of hospital stays and suicide, was rapidly resolved in the majority of cases. The development of new chemical treatments is always a lengthy process, often taking 15 years. Since animal models are used to discover antidepressants, such as the forced swim test (measurement of the time an animal placed in a container with water spends immobile, not trying to escape the situation by swimming or scaling the walls – a “depressed” animal will spend more time immobile) or the learned helplessness paradigm (an animal that has been taught that it is impossible to escape a painful stimulus is less likely to try to escape it even if it has the chance to do so – and a “depressed” animal even less likely to), these methods suffer from high uncertainty as an animal cannot give a subjective description of their feelings. Therefore testing in human subjects is preferable in order to obtain definitive results and reduce false positives and false negatives. The off-label use of an already approved drug can considerably shorten drug development and facilitate clinical trials. Left side (blue): Proof of concept in humans – ketamine reduces depression and suicidal ideation amongst a sample of people who do not respond to current medication. 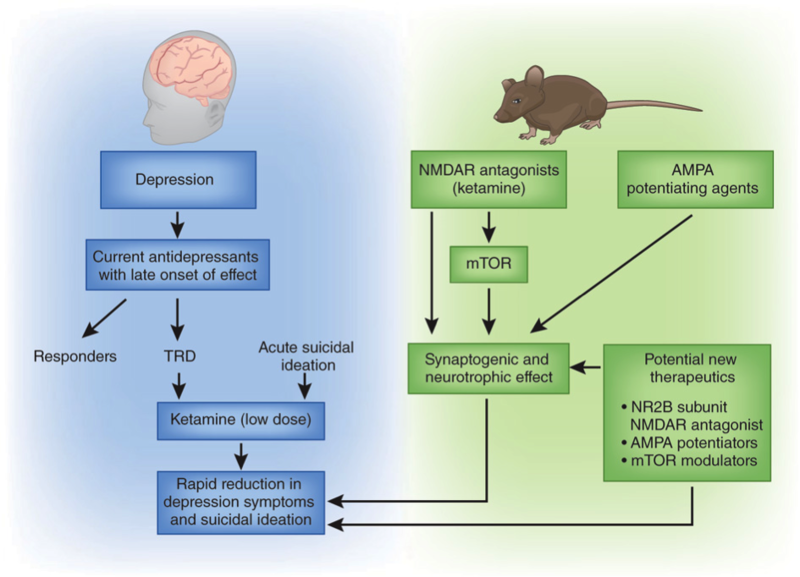 Right side (green): Exploration of the mechanism by which new medications act in cell cultures and animals – ketamine and other novel therapeutics increase the formation of new synapses which can reverse depression. Pathways crucial to synapse formation such as NMDA receptors, mTOR (mammalian target of rapamycin) and AMPA potentiation are shown to be involved. Image source: Murrough and Charney, “Lifting the Mood with Ketamine”. However, ketamine is far from an ideal medication to be prescribed as an antidepressant since it is ineffective when administered orally and has to be injected. Long-term effects are not well explored. These can include cognition deficits and memory problems, as the functionality of some systems in the brain tends to decrease with constant stimulation. Besides the side effects including sedation and hallucinations, there is considerable toxicity associated with ketamine. Another major problem is that ketamine is prone to habituation and abuse. The drug has been long abused in the club scene, generally in doses that abolish any benefits and are far above those required for the treatment of depression. This means ketamine itself can only be used safely in a clinical setting, since patients would likely tend to increase the dose, causing the clinical treatment to become ineffective or counterproductive. Even though these characteristics still allow for the safe conduction of clinical trials and mapping of relevant neuronal pathways, the development of a safer, more selective alternative is desirable. For example, through the use of medicinal chemistry, the addictive potential can be eliminated by optimization of the molecule to target only the pathways responsible for depression but not other related systems. In the case of a complex dysfunction like depression, taking advantage of the brain’s formidable capacity for repair and enhancing natural regeneration mechanisms (what psychotherapy and other similar methods do) is preferable over a long-term, purely chemical treatment. Knowledge of neuronal pathways central to depression permits the connection of pathways to observed biological phenomena, enabling the targeted development of non-chemical treatments or methods that synergize with current therapeutic options. A simple example: ketamine enhances the rewiring of the brain, so it could facilitate psychotherapy after short-term administration. Recently, endurance exercise has been shown to increase BDNF levels (brain-derived neurotrophic factor, a regulatory protein playing a central role in synaptic plasticity and learning) in animal models, thus establishing a connection of the well-known beneficial effects of exercise on depression with changes in the brain on a molecular level. We may very well see a new blockbuster against depression emerging in the next two decades, for better or worse. Even if treatments get more effective, a silver bullet may not exist for diseases like depression and obesity that are inseparably connected to lifestyle. Márton Siklós is a 2010 fellow of the Fulbright Science and Technology Award program, from Hungary, and is a graduate student in Medicinal Chemistry at the University of Illinois, Chicago.